Just a quick introduction… I am Tirc, one of the co-founders of the site. 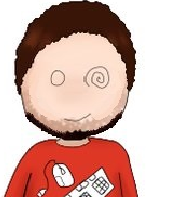 This is my first post here at ONS Gaming despite being around since the beginning. You will see more of me in the form of video content and our podcast but I will also be contributing in the form of articles. That said, let’s get to it! 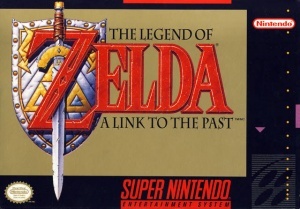 I have the pleasure during Zelda week to write about one of my favorite SNES games of all time: The Legend of Zelda: A Link to the Past. This may be the only game that I have ever beaten multiple times. Normally I am morally opposed to playing a game through to the end multiple times because I feel like I am missing out on something new. The length of the game plays a big role in why you can play through multiple times. It’s not a 20 – 40 hour venture so it doesn’t command a ton of time. It may be nostalgia talking, but I still think this game is great. When this game was released I was 8 years old. I don’t remember exactly when I got it but I don’t think it was too long after release. I was hooked from the start. I had played and beaten Legend of Zelda and only played The Adventure of Link sparingly at my cousin’s house. I’m a sucker for retro graphics, especially 16 bit graphics. With the SNES it was also possible to step up immensely from a musical perspective. The score for this game is great and is still recognizable 21 years later. Traversing through the world is much like the original game for NES The Legend of Zelda. The perspective is again a top down look at the world both in the overworld and when within a dungeon. When in a dungeon you will find familiar tools such as a map, a compass, and keys. This time the magical key is replaced with the big key. Within each dungeon is a special item which is then used, in most cases for the rest of the game, in some capacity. At the end of the dungeon you will find a boss who, when defeated, will reward you with a full heart piece as well as a pendant (in the light world) or a maiden entrapped within a crystal (in the dark world). In this tale our nemesis Ganon is at it again. He has overtaken the Sacred Realm and has spread darkness throughout. His known form is trapped in the dark world and the only way to escape is to use young maidens who are descendants of the Seven Sages and use their powers to break the seal on the Sacred Realm. Ganon’s shadow takes the form of Agahnim who gains the trust of the King of Hyrule using his magical powers to ward off unexplained catastrophes linked to the sages seal. Agahnim over throws the King and ultimately captures Princess Zelda and sends her to the dark world. 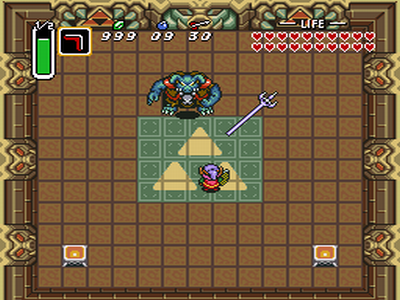 Link must acquire the three Pendants of Virtue from three dungeons in the light world to obtain the Master Sword. He then rescues the imprisoned maidens from dungeons all throughout the dark world. 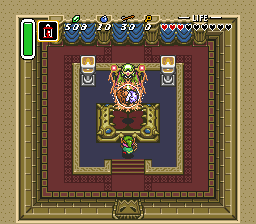 Once they are freed Link uses their power to dispel the barrier surrounding Ganon’s Tower where he defeats Agahnim and the shadow of Ganon rises from his body. Ganon, now in the form of a bat, flies to the Pyramid of Power where he and Link do battle. After Ganon is defeated Link uses the power of the Triforce to reverse the effects that Ganon had within the Sacred Realm and Hyrule. The gameplay was great in its simplicity. You had the use of your sword as well as one special item at any one time. The items could be swapped easily and magical items had a depleting magic meter as you used them. You acquired Pegasus Shoes to help you sprint and you also obtain a flute (Ocarina) which calls a pet duck to take you to one of several warp locations around the map. Many recognizable items make a return from the NES versions of Zelda such as the bomb, bow & arrow, and boomerang. The game also introduces an item that would remain a staple for quite a few sequels: the hookshot. The hookshot is one of my favorite items within the franchise. It was always used well in the puzzle aspect of the game allowing you to get to ledges and platforms that you can’t reach otherwise. A very impressive gameplay mechanic that was implemented into the game was the use of an acquired item the magic mirror. 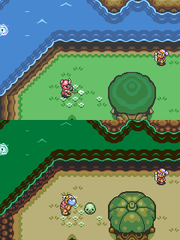 The mirror allowed Link to travel between the light and dark worlds. The clever use of this mechanic would come in the nuanced differences between the worlds. You could put yourself in a reachable place in the light world and then teleport to the dark world which would then put you in an otherwise unreachable place. The magic mirror could also be used within a dungeon. If you activated it in a dungeon you would be instantly teleported to the very beginning of the dungeon. This could be extremely helpful if inside a dungeon that used multiple branched paths near the entrance. For being the only game in the Zelda franchise on the SNES I think that A Link to the Past represents Shigeru Miyamoto’s vision well and holds up well even to this day. One bit of news that has me extremely excited is that an indirect sequel is set to release in November of this year. A Link Between Worlds will be released for the Nintendo 3DS and I believe this will be the title that finally forces me to step up from my currently owned DSi. 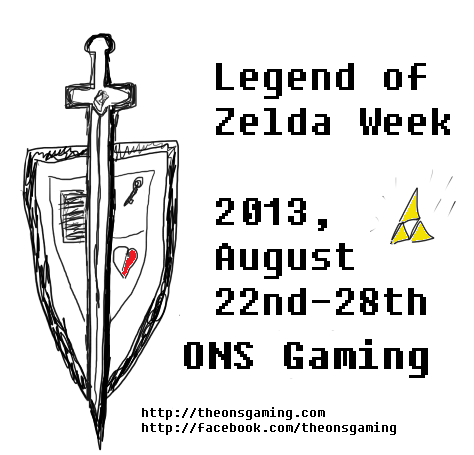 Continue to check back on the site this week for more Zelda articles as we continue to celebrate Zelda Week here at ONS Gaming!